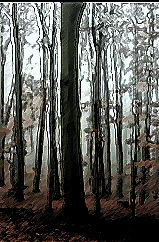 I was shaking with fear as we slowly tiptoed through the forest, anticipating danger. Ella went ahead. We were frightened! Ella started to scream and we ran to her side. The noise was a man. A man with a sack. A sack filled with jewelery. He was a theif! And we, were heroes!